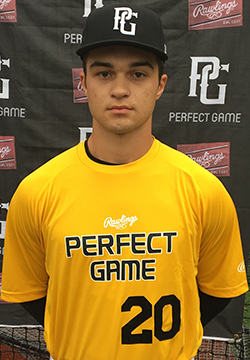 Armando Alvarez is a 2019 1B/LHP, OF with a 5-10 175 lb. frame from River Vale, NJ who attends Don Bosco Prep. Medium frame with an athletic build. Projects for additional strength. Primary first baseman, centers the baseball well and funnels the baseball well out front. Works through exchange with fluid, clean actions. Compact arm circle at separation and released from a three-quarters slot topping at 73 miles per hour. Also worked out defensively from the outfield showing smooth, deliberate footwork while closing to the baseball. Clean funnels while working through the baseball with developing fluidity through transition. Released from a three-quarters slot generating uphill carry to the bag. Right handed hitter with an even, balanced stance. Lower half has rotational actions to contact while hands works on a simple, direct path to contact. Barrel works through the zone on a naturally leveraged plane with present bat speed. Flashed the ability to turn the barrel to contact and work to pull side with some authority. Kept thins simple, consistently repeating barrel plane creating hard contact throughout batting practice. Good student. Named to the 2017 Sunshine Northeast Showcase Top Prospect List.